Our Green Coffee Bean is the highest potency, purest Green Coffee Bean Extract supplement available. 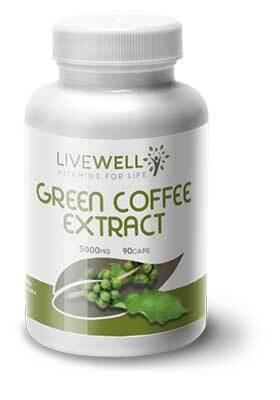 Unlike many other Green Coffee Bean supplements, our extract does not rely on caffeine to be effective. Our Green Coffee Bean supplements only have around 20mg of caffeine per serving - a cup of coffee has over 100mg. Because it is not a stimulant, it won't make you jittery or raise your heart rate like other supplements. With it's pure, high potency formula, our Green Coffee Bean is far ahead of other brands. Minimum of 50% Chlorogenic Acid. 90 x 5,000mg vegetarian capsules. Ingredients: HPMC Vegetarian capsule size 0, Green Coffee Extract 20:1 50% (Starch), Microcrystalline Cellulose, Magnesium Stearate (Veg Source), Silicon Dioxide (Sipernat 22s). Take one capsule three times daily preferably with a main meal.